Packing up your possessions in preparation for removal day or for a lengthy time at a storage facility can often be a long and tedious task. However it is of utmost importance that this process is carried out in the correct manner, to ensure that you avoid any breakage or damage to your items whilst being moved or stored. Most removal companies and associated internet sites should sell a range of packing equipment. There are packing boxes that come in all shapes and sizes, bubble wrap, packing tape, furniture covers, removal and transit blankets, moving crates, in addition to various packing accessories such as padlocks. There are special techniques associated with packing valuable items. For smaller items it is advisable to use several different types of packing materials in combination with each other. Different types of specialised packing boxes can be purchased, such as boxes that have built in dividers constructed into their design in order to avoid your items of value knocking together in the box. This is a common problem and can be avoided by packing smaller valuable items tightly together, whilst ensuring that there is still some form of separation. It is also advisable not to pack any items on top of one another, again to avoid any contact and reduce excessive movement of your items on moving day. Larger valuable items such as antiques should be wrapped in bubble wrap and or foam packing. If your larger valuables are big enough to be packed into boxes, as with the smaller items then it is advisable not to cram too many of your items into one box. Get a reasonable sized box for your item, however in order to avoid your items knocking together in the box it is essential that any excess space in the box is kept to a minimum. This can be done by filling any remaining space in the box with a loose void fill (small polystyrene chips) and/or various different types of foams or packing papers, depending on the specificities of the item that is being packed. For example if packing glassware, such as wine glasses, a professional company should be able to offer special boxes, such as those with dividers, and packing paper to wrap around the glasses. There are also a number of companies that specialise solely in the packing of valuable items such as sculptures, ceramics, antiques, paintings and other fine art. These companies would be able to pack your item, and should also offer courier services and all risk insurance to give you piece of mind in the unfortunate incidence of any damage or breakages. They would also use other specialised packing materials, such as foams, acid free tissues and crates. The use of these companies is advisable if your item is of extremely high value, however due to the specialism required this is likely to be reflected in the cost. 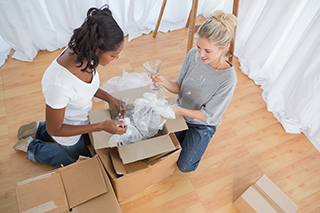 If you are looking to purchase packing materials in large quantities due to an approaching moving day, companies should be able to offer special offers and discounts for large purchases. This should also be the case if buying packing equipment from the same company that is carrying out your removal or storage of your items. If feeling unsure or apprehensive about the correct methods of packing your items, or if you are unable to pack due to time constraints, professional companies should have the capacity to be able to offer personnel who can pack for you and help you in the packing process. However if this is the case, be sure to check references and recommendations which can usually be found on the company’s internet site.